network | Is life worth living? CHEMBL is a one of big public database. It has lots of useful data. If you are good at python, pychembldb will be good tool. I like the python package. And I found another package chembl “chembl_web_client”. The package can install using pip. Yah, it easy. OK Let’s get data from python ! For example following code get data about Ty-kinase inh c-Met. For example, chembl_assay_id is 1003887. Result can get as python dict-type. If you can use pandas, dic can convert data frame. Also easy to get compound data. Visualization of data is very important. Some years ago, I was interested in cytoscape to visualize molecular network (a.k.a. similarity, MMP, etc.). But it was difficult to integrate python script. Today, I found cool python library “d3py”. This library can make any graphs easy like ggplot, vincent and also can make network using networkx. 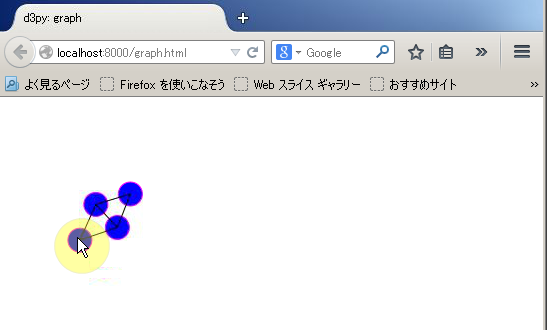 type p.show() commnad, or run the script, local server was started and you can get intaractive graph. So, How about make mmp network using this library and supply data for MedChem ? Node measns each molecule, and edge means transform.It was very easy to coding. I think it was very interesting, but for other chemist Hmm :-( .